If you’ve ever thought about taking a River cruise, be sure to watch the First Time River Cruiser video to learn what it’s all about! Discover cruising on an intimate scale, with a personal touch. With no packing and unpacking, river cruising is a relaxing alternative to other types of travel, offering an ever-changing mural of scenery from your ship. Your comfortable stateroom offers a wonderful river view and plenty of storage space. The dress code is casual and comfortable, and there’s no seating plan. Unlike a hotel, your Viking Cruises ship takes you to places like Amsterdam, Vienna and Budapest, often docking in the heart of a vibrant city or a quaint village. All onboard meals, including complimentary wine and soft drinks served with lunch and dinner, and a host of immersive shore excursions are included in the price, making a river cruise with Viking a great value. Join Viking Cruises® on an unforgettable journey enriched by knowledgeable local guides, activities and excursions that immerse you in different cultures, and fine regional wines and cuisine. 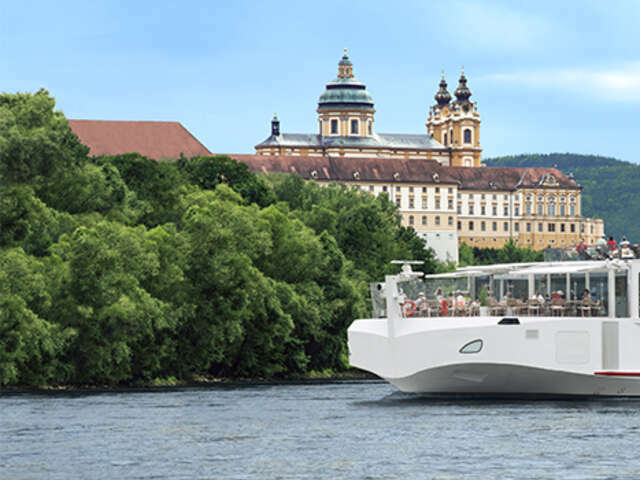 Designed specifically for river cruising, Viking river ships are light, airy and spacious. Relax on the Sun Deck, enjoy a drink in the stylish Lounge or read a book in the Library. From delicious breakfasts and lunches to five-course dinners, you’ll enjoy the finest cuisine. This is what life on board your floating hotel is like.